The United States’ National POW/MIA Recognition Day is observed across the nation on the third Friday of September each year. Many Americans take the time to remember those who were prisoners of war (POW) and those who are missing in action (MIA), as well as their families. The VFW will not rest until we achieve the fullest possible accounting of all missing American military service members from all wars. The numbers of unaccounted-for personnel are staggering, currently 83,000, and the length of time since they have been lost is extensive, going back to World War II. Many will never be recovered because the loss occurred over deep water, were due to catastrophic explosions, or eyewitnesses to the incidents have long since passed, but every new identification helps bring closure to one more American family, and is one step closer to achieving the fullest possible accounting of our missing. It is also a recommitment to those serving in uniform today that America will bring you home. 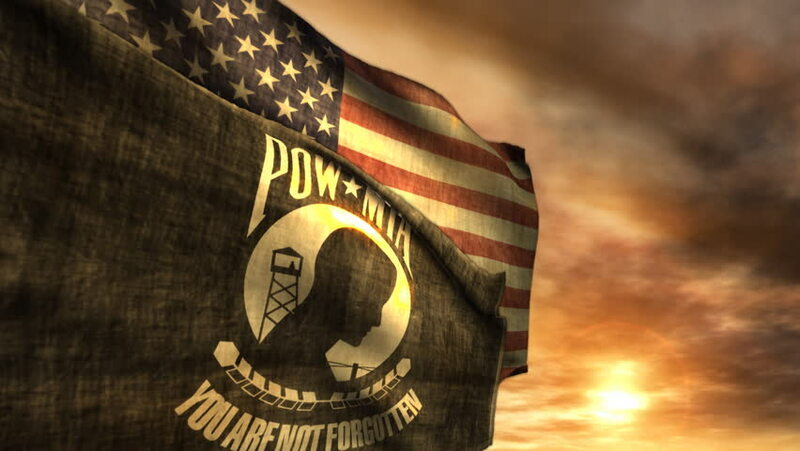 The VFW encourages the U.S. government to continue its POW/MIA accounting efforts, and is directly engaged with other nations and their veterans’ groups to urge their cooperation and assistance to obtain information about missing Americans. VFW national officers make annual trips to Pacific, Asian and European countries where they always meet with senior host-country officials to stress the importance of conducting investigation and recovery operations, as well as gaining access to documents and archival research facilities. The National League of Families’ POW/MIA flag symbolizes the United States’ resolve to never forget POWs or those who served their country in conflicts and are still missing. Newt Heisley designed the flag. The flag’s design features a silhouette of a young man, which is based on Mr. Heisley’s son, who was medically discharged from the military. As Mr. Heisley looked at his returning son’s gaunt features, he imagined what life was for those behind barbed wire fences on foreign shores. He then sketched the profile of his son as the new flag's design was created in his mind. The flag features a white disk bearing in black silhouette a man’s bust, a watch tower with a guard on patrol, and a strand of barbed wire. White letters "POW” and "MIA”, with a white five-pointed star in between, are typed above the disk. Below the disk is a black and white wreath above the motto "You Are Not Forgotten” written in white, capital letters. The flag can also be displayed on Armed Forces Day, Memorial Day, Flag Day, Independence Day and Veterans Day. The flag can be displayed at the Capitol, the White House, the Korean War Veterans Memorial, and the Vietnam Veterans Memorial, national cemeteries, various government buildings, and major military installations. The VFW’s Action Corps Weekly e-newsletter lists returned MIAs once their names are posted on the Defense POW/MIA Accounting Agency’s website at http://www.dpaa.mil/. POW/MIA Recognition Ceremony honors WWII Army Sgt. Copyright (c) 2019 JOE BAGLEY VFW POST 2582.